Trustees fights for Chuitna: Should salmon have water rights? In May, our summer interns, Maggie and Jenna, jumped into legal research and writing. Summers do fly. Next week Maggie Massey will finish her time with us and do a road trip back to Oregon where she will finish her last year in law school. Here, she writes about water rights and a recent court decision that requires the State of Alaska to make a final decision on a water right application that would protect salmon. Middle Creek, where a citizens coalition applied for water rights that would protect salmon. Photo courtesy Alaskans First. It sure seems like Alaska has no shortage of water. Since the 1800s, people have proposed exporting mass quantities of Alaska water as glaciers or in pipelines, and private companies have turned Alaska water into products sold near and far. 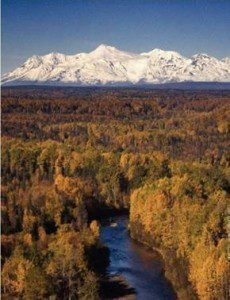 Who gets to use the water in Alaska streams and rivers, and how they get to use it, can harm wildlife and people, however. Water is life, after all, and over- or misuse can do damage and create conflict. Yet the management systems we use to decide how water gets used and who gets to use it often fail to ensure equity and sustainability. Eventually, we all lose. The concept of water treated as commodity has led to conflicts in many part of the world, including the western United States, where those who secured water rights first—those with “senior” water rights–get their full share of water before other users. Modeled after the allocation of mineral rights during the gold rush, this system encourages consumption and a “use it or lose it” mentality. In other words, it destructively prioritizes water use that threatens the health of waterways and the animals and people that depend on them. Chuitna River. Photo by Danion Brook Kintz. In some streams and rivers in the western states, virtually all of the water is removed from the waterway for industry and agriculture, leaving none for fish or other aquatic species. Streams have been literally sucked dry. To counter this outcome, many states implemented “in-stream” water rights programs that allow those who have senior water rights to leave water in-stream, reserved, to protect ecosystems and fish health. Alaska has a similar program. Unlike many states, Alaska allows private individuals to apply for and hold in-stream flow water rights. This provision has been on the books since the 1980s, but the state rarely grants these rights. In 2009, a group of Alaskans, The Chuitna Citizen’s Coalition, applied for in-stream flow water rights in Middle Creek, one of the most significant tributaries of the Chuitna River. The State of Alaska fought the application from the start and has refused to finalize a decision for nearly a decade. Trustees for Alaska filed a lawsuit on behalf of the coalition in 2011 to challenge the state’s delay in making a decision on the application. 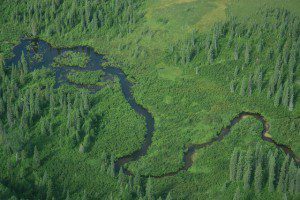 Four years later, the Alaska Department of Natural Resources (DNR) issued a decision that acknowledges that an in-stream water right would be in the best interest of salmon and salmon habitat, but it has not yet granted a water right. A mining company, and other industry groups, appealed the decision, and the state has stalled the application decision administratively and in court ever since. In May 2018, Alaska’s Superior Court ordered DNR to finalize its decision on the coalition’s application, but the state immediately asked the Supreme Court for an extraordinary, expedited review to avoid taking action. This is great news for Chuitna Citizens, salmon, and all Alaskans. The State of Alaska was trying to wriggle its way out of protecting salmon habitat, but the court stepped in to hold the agency accountable. The amount of water at issue in this case is small, but the lawsuit stands for the larger principle that Alaskans have a stake in protecting the state’s water resources. Water equity and conservation will become increasingly important in Alaska and around the world as the changing climate intensifies. The decade-plus battle that Chuitna Citizens and Trustees for Alaska waged to keep water in Middle Creek demonstrates the importance of perseverance and a long-term vision. DNR’s initial decision to grant the water right to Chuitna Citizens Coalition in 2015 was the first time a private citizen group was awarded an in-stream water right. It was quickly appealed and delayed, but Trustees will continue to fight for the right of Alaskans to protect water–and salmon.